Van Gogh, Munch, Vermeer, Caravaggio, and Goya are five iconic European artists whose inspirational works have been obsessed over by art lovers and travelers for years. To see masterpieces such as Starry Night and The Scream up close is awe-inspiring, but this guide offers true devotees even more. 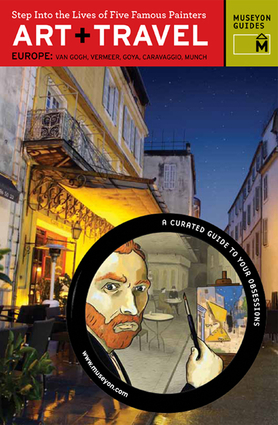 The book provides detailed walking tours of Van Gogh's Arles, France; Munch's Oslo, Norway; Vermeer's Delft, Netherlands; Caravaggio's Rome, Italy; and Goya's Madrid, Spain; as well as meticulously researched articles on the artists' lives. It is packed with useful sidebars, suggested itineraries, museum locations, and an extended index of artwork, and features color photographs of more than 150 paintings. Museyon Guides are visually oriented travel guides, accessibly written for the greenhorn as well as the aficionado, featuring academic-quality information on artistic and cultural interests and obsessions. They are based in New York City.